Macbeth: On Tuesday 6th November, our 6th year English students attended a performance of Macbeth in Athlone, as part of their course studies. A great day was had by all, with students noting the trip was a great benefit to their own studies. Many thanks to Ms Murphy and Ms Yorke for accompanying and organising the trip. 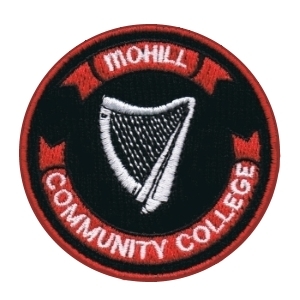 Sports: The under 19 girls basketball team had a successful encounter with Coola, at home in MCC last week, winning and moving forward to the semi final of the competition, good luck to the girls and manager Ms Hargaden Ward. The Senior boys also took a win at home, under management of Mr Shortt, with a win of 1-13 to 1-6 over Carigallen. Well done to all! Student V Teacher game: As usual, this encounter caused great entertainment for all involved! The sports hall was packed on the last day before holidays, to witness one of the highlights of the school year. Amongst the impressive skill shown from student and teachers alike, there were some debatable tackles and decisions from all sides! A final score of 4-4 is testament to the intensity of the game. We look forward to the next one already! Well done to all for their support and organisation in the run up and on the day of the event. History trip: Senior History students, along with Transition Years visited Carrick Cineplex recently for a viewing of the film, The First Man, as part of their History studies. Students found the trip beneficial to their course work, with many thanks to Mr Nolan for organising the outing. Debate: Our TY debate team were busy again last week, taking on Lanesboro in their latest encounter. Although the group lost out on this occasion, from chatting to the team it is clear to see enthusiasm is high and they are already busy planning the next one. Sports: Our first year MCC boys represented Leitrim this week at a 5 a side soccer blitz in Sligo IT. The team, under management of Mr Beirne had a very successful run in the competition, well done to all on their great performance. The U-14 boys took on Ballymote, at home in MCC with Mr Duffy overseeing a great win for the team. Our U-14 girls were unlucky to lose out to Manorhamilton in an away fixture, hard luck to the team and manager Ms Fitzpatrick. TY Quiz: Congratulations to Ms Hargaden Ward and her team of four Transition Years, on their success at the Leitrim Library quiz in Ballinamore recently. Maeve Newton, Robyn Gaffey, Mark Reynolds and Ronan McNabola took home a win, well done to all involved! TY Activities: It was a busy week for our Transition Years. They headed for Sligo on Wednesday, to a Road Safety Awareness day, where they engaged with members of the emergency services and survivors of road traffic accidents, to raise awareness among the group on the issue. Many thanks to Ms Purcell for organising the visit and accompanying the class. The students also completed their etiquette classes this week, with Michelle, a guest speaker who worked with the students on life skills such as tying a tie and dinner table settings. While chatting to students about it, they agreed it was something they didn’t know they needed and thoroughly enjoyed! With thanks to Ms Maxwell & Ms Kellegher for organising this module. Sports: In Basketball, our Senior boys and girls team were in action, at home in MCC. The boys suffered a loss to Dunloe (Donegal), hard luck to the team & Ms. McGovern. Our girls came through with a victory, against Coláiste na Carraige (Donegal) sending them forward to the North West Schools final on December 7th. Well done to Ms Hargaden and her team! The Senior girls football were away this week, to Boyle Abbey Vocational School. After a great comeback after half time, the girls unfortunately lost out to the home team. Hard luck ladies and to manager Ms Mitchell. Our under 14 boys were unlucky on Friday 23rd November to lose out by one point to Ballinamore, however a win in the previous week sees them go through to the last 16 of the competition. Well done to Mr Duffy and his team. Scholarships: Congratulations to Molly Keegan, who will receive a scholarship award from DCU, where she is currently studying. Molly will receive her award based on academic excellence in her exams. Congratulations also go to Nina Greene, a current student of Trinity College Dublin and a past student of MCC, who receives an Entrance Exhibition Award as a result of her high performance academically. Well done ladies! World Wise Global Schools: This year, our Transition Years are working upon the sustainable development goal of ‘poverty’. They have researched and debated the causes of poverty and examined how we, at a local level, can help encourage our community to participate in reducing poverty. The TY class are currently preparing to plant a school orchard of apple, plum and pear trees, sourcing local suppliers for all resources. It is an exciting project to be a part of! Thanks go to Ms Maxwell for her hard work with the group. We will keep you updated on the progress! Football: On Tuesday last week, the Senior boys were in action, at home in MCC against Drumshanbo. The boys narrowly missed out on the win in a close encounter. Hard luck to the team and manager Mr Shortt. Anti Bullying Week: Working hard against anti bullying is important to us here in MCC and this week we welcomed Garda Hugh Barry to speak to the students about bullying and in particular, cyber bullying. The students gained great information from this so a huge thank you to our guest speaker & Ms Columb, for organising this and the posters that also helped highlight the issue. Well done to all on raising awareness on a very important topic.